Ken Lauher is your source for Feng Shui and intuitive advice that works towards transforming the areas of your life that are causing you the most problems. His inspiring and transformational work with well known actors, actresses, TV Hosts, singers, songwriters, CEO’s, and business owners, businesses and organizations makes him a sought after speaker. Since childhood, Ken has always had a fascination with how a space felt and how it impacted the occupants. At the age of 7, he was moving large pieces of furniture around in his bedroom to make the space work better for him. As he got older, he started to understand how he could learn more about a person and their current life situation just by viewing their physical space. As Ken developed, he became more interested in Feng Shui, meditation and Eastern philosophy. He knew deep down that he would eventually apply this interest and potential talent to a future career. In his late 20's he went through a near death experience where he saw the movie of his life. It took less than a second, but as he explains it, "it was like viewing an 8 hour movie of your life that had been recorded from childhood to the present moment. In the movie you see family, friends, childhood teachers, hear conversations that happened decades ago and even experience a person's scent or perfume." At that time, he realized and begun to understand about other dimensions and that there was a larger scope to his life. The former Wall Street broker who Co-Founded a Retail Brokerage firm, was managing owner of a Thoroughbred Race Horse Management Company (bought, sold and raced thoroughbred horses), and marketing specialist, he now understands that his purpose in life is to help individuals, businesses and organizations experience everything that is possible when using the energy of the Universe and Feng Shui. In March of 2000, Ken created a business organization to help promote small business owners to increase their visibility and networking opportunities while studying Feng Shui on the side. He then enrolled and graduated from the 3 Year BTB Feng Shui Master's Training program and became a direct disciple of His Holiness Grandmaster Professor Lin Yun Rinpoche to help him further his talents. 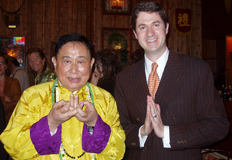 As a result, he is grateful for the gifts of Feng Shui and for the guidance of his teachers including His Holiness Grandmaster Professor Lin Yun Rinpoche (the world's foremost Feng Shui Master), Steven Post (The First American Teacher of Feng Shui), Barry Gordon, Dr. Edgar Sung and Rosalie Prinzivalli. And other teachers including Robert Peng for helping to develop Ken's energy healing abilities and C.K. Chu for his wonderful guidance and teachings in Tai Chi and Chi Kung. The Next Level... "Experience The Possibilities"
Ken is all about personal transformation and growth, empowering and inspiring tens of thousands of women and men around the world to have “Freedom” in your personal and financial life. By showing you the patterns for success and blending it all together with the right mindset, anything is possible. Ken will show you how you too can "Master Your Life" moving through your limits to what you think are possible for yourself and your space. He invites you to come along this journey with him and to like never before get unstuck, achieve your goals and live a more fulfilling life. P.S. If you're serious about creating Rapid Change and Transforming your life, then apply for a FREE Life Strategy Sessionwith me.